« Is Banning Skinny Models a Legitimate Function of Government? I get agitated when I think about”energy policy” in Washington. The jackasses in that town are requiring us to use crummy light bulbs. They’re mandating sub-standard washing machines. And they’ve coerced us into ridiculous “low-flow” toilets that don’t work very well if you happen to…um…deposit something that reminds you of Washington. And let’s not forget examples of sleaze and corruption such as the Solyndra scam and the ethanol racket. But I haven’t written anything on rising gas prices because, in general, I don’t think politicians can be blamed. Yes, prices would be a bit lower if the crowd in Washington wasn’t blocking pipelines and hindering exploration, but those policies presumably don’t cause sudden price spikes. So I’ll mostly let Obama off the hook, just as I’ve sometimes defended him in the past. 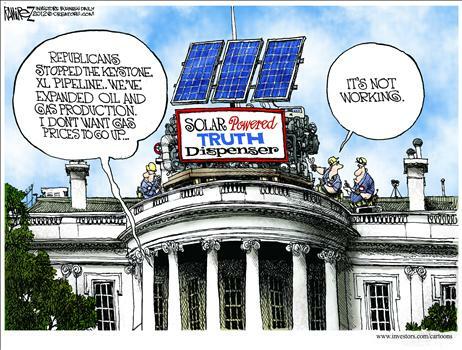 That being said, the Administration’s energy policies are a joke – especially the plethora of green energy subsidies. So even though I don’t blame them for higher gas prices, I’m nonetheless amused that the White House is taking a beating on the issue. As illustrated by these cartoons. 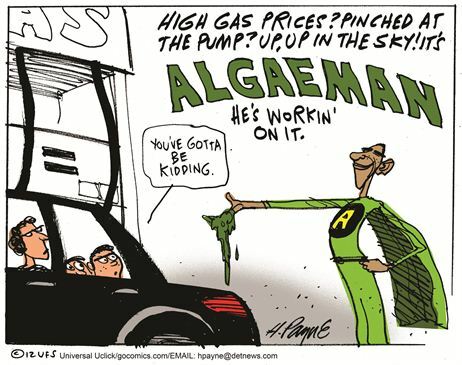 The Algaeman cartoon reminds me of President Bush’s silly switchgrass policy. Here’s a Ramirez cartoon about the prevarication, dissembling, and obfuscation at the White House. Last but not least, here’s a funny image a friend posted on my Facebook page. These are all funny images, but the history of botched government intervention in the energy sector teaches an important lesson. As illustrated by this poster, you’ve asked a very silly question if more government is the answer. I’ll have to part ways with you on this one. When those in political power, and the bloated bureaucracies they oversee greatly and negatively impact supply they create the conditions, both unintentionally and in this case intentionally by their own admission (see Steven Chu) which make sudden spikes not only probably but arguably expected. Candidate Obama promised his policies would cause energy prices to “necessarily skyrocket” and put in place a man who echos his desire to see Americans paying European type prices under the guise of environmental concerns. As a famous political commentator says “follow the money.” If one really wants to know who is behind the environmental movement in the U.S. follow the money. Where it leads is unsightly and speaks to the enemy who is now withing the gates. 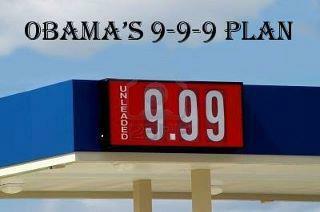 Gas price increases are simply one of the manifestations of America’s decline. Gas prices are only rising in relative terms for Americans and other western world voter lemmings who, having flattened their effort reward curves, are unable to keep up with average world growth — and thus see their purchasing power being crowded out by the emerging world. If you are Chinese, growing at 8% per year for the last decade then gas is getting cheaper in terms of purchasing power. So rising gas and commodity prices are simply a manifestation of western world purchasing power being crowded out by the emerging world. How did Americans think that decline would manifest itself? Well this is a preview. When hope that someone else, someone smarter, someone more competent, or someone simply harder working, will work so that redistribution will prop up your mediocre by American standards but still top 20% by world standards — then decline sets in. How does decline manifests itself? Well first immigrants with higher production to cost ratios try to come in to in part displace you. then since you try to close the door, American companies export their operations and the rising emerging world starts crowding out your purchasing power — as you see with rising gas prices. Then you try to once again go against fundamentals with gimmicks by trying to block American companies from exporting “your job”. So then foreign companies form producing exactly what you do, with foreign workers, foreign management, and foreign capital. You get even more stressed and you vote for more government “care” packages to fill in the gap. You have closed the suicide spiral. Your HopNChange is complete. You learn French.